Atom allows users to build their own forms without having to write any code. Users can create what tabs are needed, what field types are used, whether or not attachments are required, whether or not photos are needed, and what fields have parent-child relationships. The Atom team has prebuilt forms for things such as NBI, FHWA, FRA, and other regulatory needs. Atom is built by some of the most well known inspection engineers in the industry. The Atom team has built customized templates for inspections including: bridges, signs, and other ancillary assets. Atom allows users to link forms to the asset management portion of our product. Users can update assets from the form based on ratings associated with elements. Atom allows each organization to build a custom Help Center. 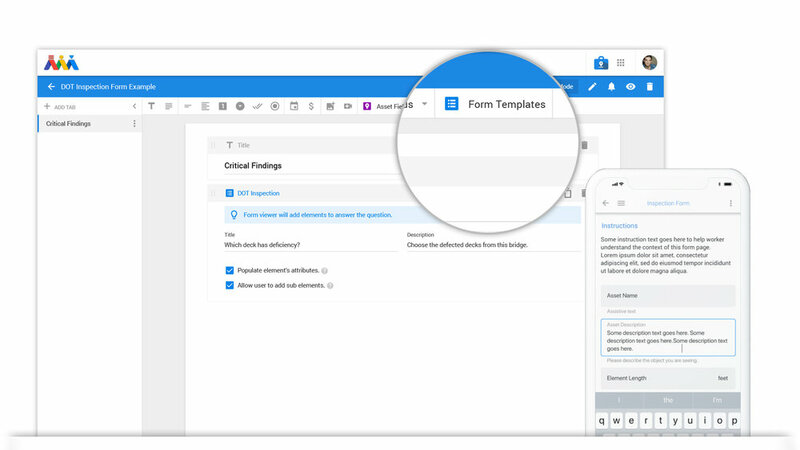 Users can go to their own Help Center to understand what their data dictionary looks like, how to executive custom built workflows, expectations of information provided, how to create data, how to build teams, how to review analytics, how to sign in, and more. Users can link acronyms from their inspection form to the data dictionary in the help center to understand real-time what to fill-out during inspections.